Yeti Boomer dog bowl: This Yeti-tough dog bowl holds an impressive 8 quarts of food or drink for your furry companion. It is built tough and stable making it great to take along for hikes, or for placing out on the patio for a hot summer day. Available in both black and stainless steel (other colors are special order only). Hard-sided Cooler - "Roadie" and "Tundra" coolers: These bear-proof coolers offer 3 inches thick of insulation all around including the lid. The rubber seals and tight fitting latches ensure that the cold air doesn't escape! Great for road-trips, hunting, fishing, tailgating, and backyard barbecues. Available in 20qt Roadie size, as well as 45qt and 60qt Tundra sizes. In-stock in White, Tan, and Blue. NEW ITEM: We also have the Yeti Haul coolers which is their new wheelable cooler, with never-flat tires and a sturdy steel handle! Available in white only. Soft-sided Cooler - "Hopper" and "Hopper Flip" coolers: These heavily insulated coolers offer the the cooling power of Yeti's hard-sided coolers but with the mobility that these shoulder strap models present. We stock Hopper Two 30 coolers in both tan and gray as well as the Hopper Flip coolers in two sizes (12 and 18) in both tan and gray. Rambler Travel Mugs: We stock the full line-up of double-insulated rambler drinkware, including 10oz lowball, 20oz ramblers, and 30oz ramblers, as well as the colster and 14oz mug (holiday only). The stainless steel is available in all styles, and Duracoat colors are available year-round in black, seafoam, brick red, white, navy, and charcoal as well as limited edition colors (when available). Rambler Bottles: Rambler bottles are the durable bottles with screw-top lids. These are great for hunting, fishing, backpacking, and storing in your purse or travel bag. The tight-fitting lids ensure that there will be no leaks! They are double-insulated as well to keep your beaverages both cold and hot. Available in 18oz, 26oz, and 36oz. Duracoat colors are available in the 18oz and 26oz sizes only. Accessories: Yeti makes loads of accessories and we try to stock them all. 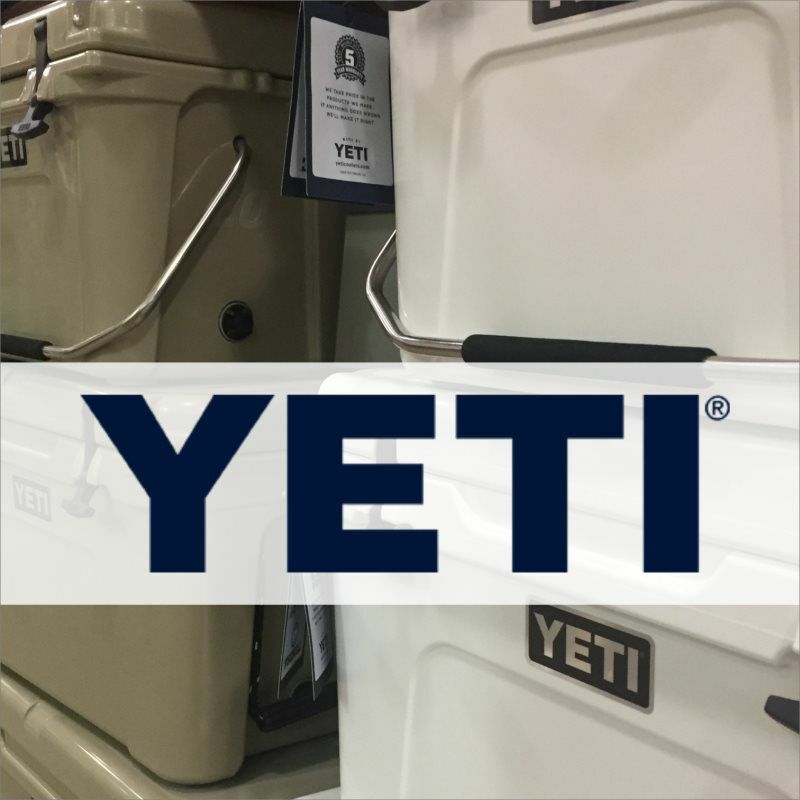 For their coolers, we stock the Yeti Ice in 1#, 2#, and 4# sizes. These freeze quicker than traditional ice packs, and stay frozen longer thanks to Yeit engineering! We also carry the security cables for tying down coolers to your trunk bed. For the Rambler bottles, we carry the chug and straw lids. For the Rambler mugs, we carry the straw lids, handles, and replacement Magslider lids. Weber has been the leader in the gas and charcoal grill market for years and their quality and performance keep customers coming back for a new grill, but often not until the old one gets really old because the typical life on a Weber gas grill is 10+ years. When you are working with high quality parts and have access to replacement parts when needed, Weber is truly a grill that you will enjoy for years to come! We stock most every grill that Weber makes and sell them year-round at Weber minimum advertised prices. You will NOT find a Weber grill for a lower price, anywhere. Many of our models also include free assembly and local delivery! 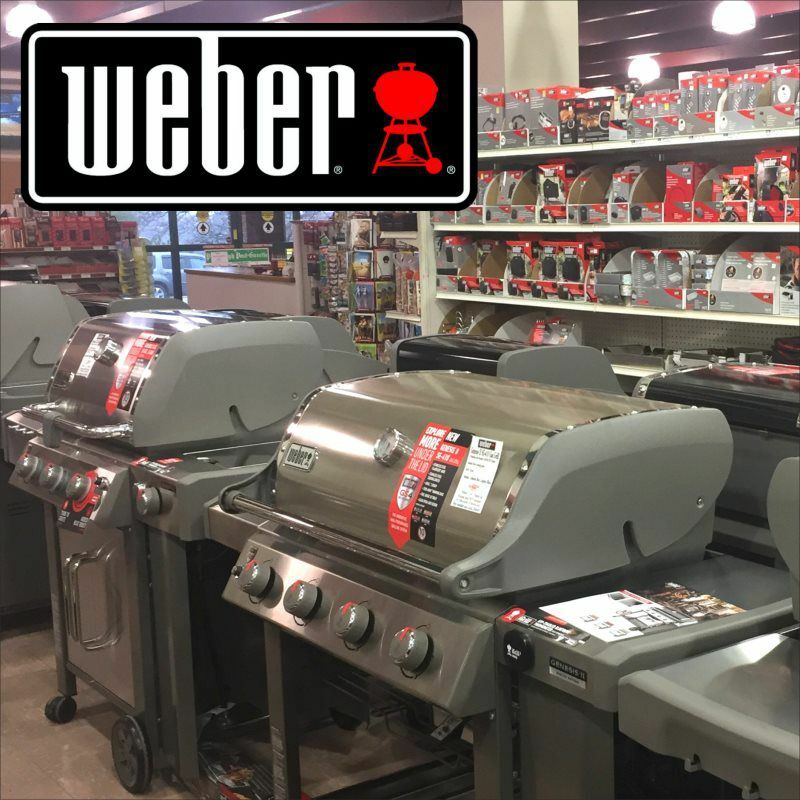 Come check out our huge display of Weber grills. We have most every grill and color on display for you to reference and compare, including Weber Q-Grills, Weber Spirit II, Weber Genesis II, and Weber Summit gas grills, as well as Weber charcoal kettle and the Weber Smoky Mountain Cooker. Let our experienced sales staff help you pick out the right model for your cooking needs and desires. Our combination of selection, service and price is as good as you will find in the Pittsburgh market. In fact, we are Pittsburgh’s largest Weber dealer! New for 2019 are the redesigned Weber Genesis II gas grills. Weber made some small changes to the Genesis lineup 2 years ago, but more changes occurred for 2019 in attempts to offer the homeowner more choices and flexibility inside of their most popular line-up of grills. Now available are side accessory burners (a high BTU gas stove burner that is perfect for sauteing at the grill site). Also available are "sear burners" to increase the heat of your grill in a concentrated area for the industry's best searing results. Also, new for 2019 is an extended warranty which now covers all grills parts for an astonishing 10 years! All Weber Spirit II grills have been reduced in price from their 2018 catalog prices! These grills were already an exceptional value, now they are even sweeter. If you are casual griller, but want the quality and durability of a Weber grill, you really can not go wrong with a Weber Spirit II barbecue. Available in 2 and 3 burner options. As mentioned above, all 2019 Weber Spirit II and Genesis II barbecues now come with an unparalleled 10 year warranty on all parts and components. This warranty is really unheardof when it comes to gas grills and is one more reason that you should buy a Weber. Looking for a natural gas Weber grill? You have come to the right place! We understand that there is a growing demand for natural gas grills and if Weber offers a model in natural gas, we make sure to stock it! Natural gas grills are super convenient because you never have to worry about running out of propane in the middle of a cook. Even better yet, natural gas grills cost little to nothing more than their propane counterparts in the Weber line-up. Not sure if we have the mode is best for you? Please give us a call or stop by our large display to see all of the options from Weber in person! We will be excited to talk to you about any questions you might have. We can also check our inventory to see what is in-stock for immediate purchase. We pride ourselves on having the grill that you want and being able to get it to you quickly! Most grills that we sell include free assembly and if you elect for delivery services, we can typically get a grill delivered to you within the week, even during the busiest times of the grilling season. • If your not already a Rollier Preferred Customer, sign up when you buy an Egg to receive 1% back on this purchase and all future purchases. The Big Green Egg is one of the most versatile grills on the market. The patented green “egg” shape is not just another charcoal grill! You can grill, bake, sear, and smoke on this guy, and do all of these tasks really well. Grill - Chicken, fish, pork, hotdogs, and vegetables have never tasted better. The Big Green Egg locks in the juices when items being cooked because the air inside is not so dry like in typical barbecues. The result is juicy chicken breasts that don't shink when cooked, and hotdogs that warm perfectly throughout! Sear - Customer love how hot the Egg can get. You can reach temperatures of 700 degrees and hot them there. Creating the perfect searing temperatures for red meats "pittsburgh style"! Bake - With the addition of the convEGGtor, you can redirect heat to the edges of the grill and create a convection like cook that memicks your oven! You can bake pies, breads, pizzas, and so much more. Pizzas are so popular on this grill and we frequently hear from customers that love to "crank" the heat up and bake thin crust pizza pies in just 5 mintues! You can even lower the temperatures and cook deep dish pizza as well. There are just so many options here. Smoke - The many reason why so many of our customer purchase an Egg is for the ability to smoke, low and slow! With a Big Green Egg, you can cook delicious, fall-off-the-bone ribs, or a tender pork shoulder that you can shred to make pulled pork. Smoking is popular with so many meats and fish! Just add the smoking chips or chunks to the charcoal and let the grill do the rest of the work! What sizes do we stock? We stock the MiniMax, Medium, Large and X-large models. We are happy to special order any other size for you. The large is by-far the most popular size, because it really gives you the flexibility to cook just about anything on it's 18" cooking surface. If you are looking for more space because you like to cook for larger group, then consider the XL size - which is our second most popular size! Do you stock many accessories? Do we ever! 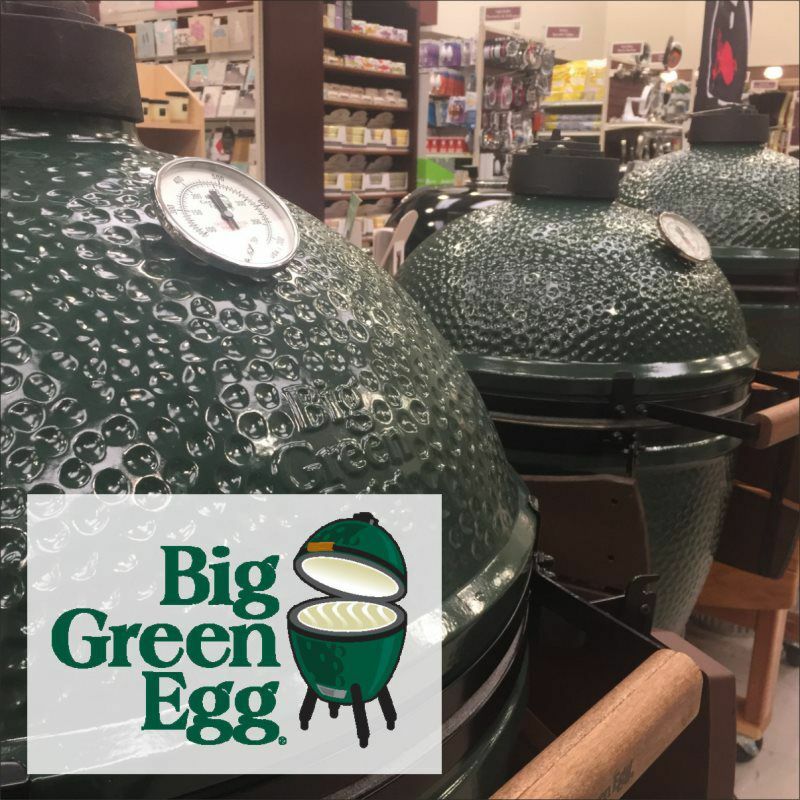 We stock most all of the Big Green Egg cooking accessories, including conEGGtors, baking stones, grill covers, wheeled nests, folding side tables, ash tools, ash pans, roasting pans, rib racks, vertical chicken or turkey holders, fire starters, charcoal starters, cookbooks, the Big Green lump charcoal, and so much more. If you are interested in learning more about these all-purpose grills, we invite you to stop in and check out our display models and to talk to our experienced sales staff. We are always here for you and will help you with any questions that you might have. All Big Green Egg grills purchased in our store come with FREE assembly and local delivery (Pittsburgh market area). • We stock most every model inside the Broil King BARON line-up of gas grills. This series offers tremendous value and a cooking experience just as good as their higher priced grills. • We stock 3, 4, and 5 burner gas grills inside of the Baron line-up. Some grill models come with side burners and others come with rotisserie burners. • Broil King grills are sold year-round at their minimum advertised prices, so you will not find a better deal on these grills anywhere. • All grills are proudly made and assembled in North America! Broil King gas grills are setting new standards when it comes to value and performance in barbecue grills. 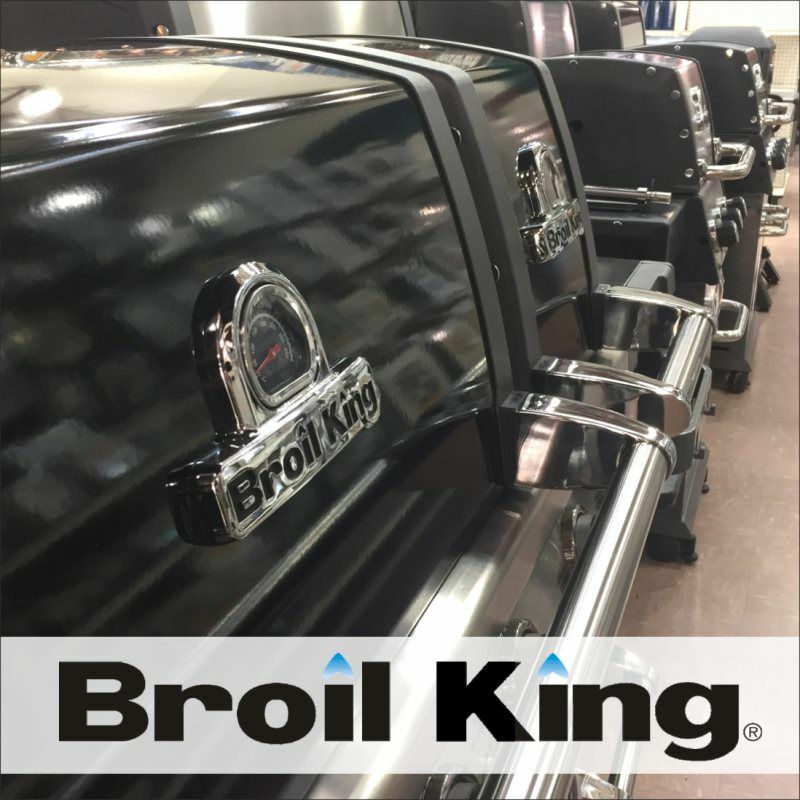 We are stocking the Broil King Baron line-up with many propane and natural gas models to choose from. We also carry two grills from the Broil King Smoke line-up, their vertical propane smoker and their XL pellet grill. Preheats Quickly – Broil King uses high BTU cooking burners in close proximity to each other. The result is more burner tips per square inch and a grill that can preheat to searing temperatures in as little as 5 minutes – even in the cold of winter! Even Heat Distribution – Broil King’s patented burner technology creates a flame on both sides of each burner. In combination, with more burners in a tighter space than competitors means that hot spots and cool spots are eliminated from the cooking surface. With these grills, there is no more moving and turning meats around so that they all cook evenly. Infinite Temperature Settings – There are 180 levels of heat that can be created from each burner tube thanks to the control knobs that lit you filter the flame from high to low, just like you are used to with your gas range in the house. These control knobs are easy to use and light with an electronic igniter. High Temperature Searing – Because Broil King grills retain heat so well and because there are more burner tips per square each, the result is a grill that can sear at crazy hot temperatures of 700 degrees. This is practically unheard-of when it comes to natural gas and propane grills. Easy-Open Lid – Lift grill lids with ease thanks to a hinge design that pivots close to the center of the cookbox. The result is a lid that takes up less space when opened and is lighter to lift and lower. High Quality Cooking Grates – Cooking grates are made from either cast iron (Baron models), heavy duty stainless steel (Regal models), or from cast stainless (Imperial models). All of these cooking surfaces offer their own advantages, but none of them are inferior. You can expect 5+ years of frequent cooking with any of their non-stock cooking surfaces. Flavor-Wave Technology – Beneath the cooking surface lays a layer of Flavor-Wave, stainless steel material that catches drippings and allows them to smoke flavor back into the foods that you are cooking. They are what makes this grill always taste like authentic bar-b-q! Made in North America – All Baron, Regal, and Imperial models are made in North America. This includes the parts and the assembly. The result are components that are built to last and constantly inspected for quality and craftsmanship. Warranty Coverage – Each Broil King Baron, Regal, and Imperial grill are covered by a manufacturer’s 2 year warranty. This includes every part of the grill. The cookbox is covered by a limited lifetime warranty and the burners tubes for 10 years.